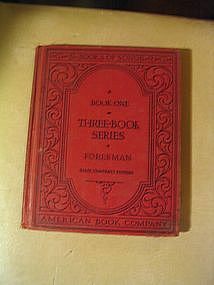 Book One of Three-Book Series by Robert Foresman. Copyright 1933 by the American Book Company. No missing pages and in stable condition. Textbook with exterior cover wear. Several school identifying marks. Pencil marks on interior pages. Complete condition photos by email. I need your zip code to calculate the postage.